The least well-known of the three was Richard Olney. He was an advocate of French cooking, but not in the grand manner. He promoted a far more relaxed country French cuisine. Olney was also a noted promoter of French wine from the Provence region. But unlike Beard and Claiborne, Olney directed his culinary empire from his home in Sollies-Toucas in Provence, France. An Iowa native, Mr. Olney left Brooklyn for France at the age of 24 and never moved back. Two books published in the early 1970s established his career, “Simple French Food” and the “French Menu Cookbook”. Richard was obsessive about cooking with seasonal ingredients and making correct wine pairings with food. Olney was also the editor of Time Life’s influential series “The Good Cook”, the first cookbooks that used minimalist step-by-step photographs to explain traditional cooking technique. Published from 1978-1980, the complete set numbered 28 volumes, each edited by Olney. Olney’s best known disciple is Alice Waters (b. 1944) of the famed Chez Panisse restaurant in Berkeley, California. She claimed that, without Richard's mentoring, she would not exist. As to his closely guarded personal life, Mr. Olney was the one-time lover of celebrity chef Jeremiah Tower (b. 1942), who worked for many years as chef at Chez Panisse before opening his own restaurant. For the most part, however, Olney lived a hermit’s life on a hillside in a village inland from Toulon, where he dug a wine cellar by hand and built a brick cooking hearth in his kitchen. He slept in a tiny alcove off the kitchen (where his gardener confirmed that Olney had died in his sleep) and ate and entertained in good weather on a stone terrace under a grape arbor. To keep it "simple", he had no telephone, no car (didn't drive), no radio, no television. He was a neighbor of Lucie “Lulu” Peyraud, a petite chef and vintner who just turned 100 last month. In 1994 Olney published “Lulu’s Provençal Table”, a book that extolled her masterful, earthy cooking and wine production from her Domaine Tempier vineyard. Lulu promoted French cuisine as a way of living – not just eating. 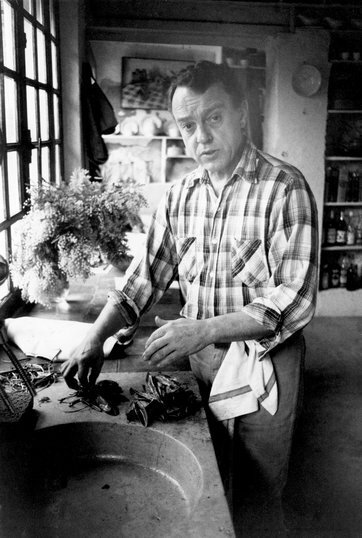 Food writer Steve Hoffman said that Olney “wished to teach us how cooking could be a path to well-being, a blessed pagan state of sensual, aesthetic and intelligent fulfillment.” Olney learned what he knew about French country cooking from Lulu, and his book about her has become a collector’s item.